Jon was attending an academic conference in Switzerland when the news hit. Nuclear weapons had been deployed in multiple countries. Washington is no more. Scotland has been obliterated. His fellow conference attendees decided to try and get out, find a plane or some other way back home. He stayed. As a historian, he feels it's his duty to chronicle the happenings for future reference. Even if there won't be any future reference, he prefers to be prepared. He and the fellow survivors holed up in his hotel are stretching their resources, rationing their food, and doing their best to stay alive until help comes. But when a body is discovered in one of the water tanks on the roof, Jon turns his eye from simple record keeping to investigating. As time passes, not only does it seem someone might not want Jon to solve what is clearly a murder but their careful semblance of order begins to turn into chaos. Resources are dwindling and there's danger outside the hotel's walls. Not only that, they've come to realize help is probably not coming at all. I enjoyed The Last as much as I enjoy any other post-apocalyptic read. And I do still quite enjoy post-apocalyptic reads! This one differed just a bit in that it tied current events into the book, making it all that much more unsettling. One of the things with this kind of read is that you can't help but calculate the feasibility of the particular apocalypse chosen by the author and, in this case, that feasibility is definitely high. It's one of the points of tension throughout the book as well as the characters, spread in nationality, turn their eyes to those they think are responsible for this event due to political views. Something I also find quite feasible. The addition of the murder is what set this book a bit apart. But the balance seemed somewhat off, as though the story wasn't quite sure what it wanted to be. Is it a post apocalyptic story with a mystery intertwined within it? Or is it a post apocalyptic story showing how quickly the breakdown in humanity occurs? More the latter than the former and yet the focus still wasn't quite as sharp in that regard as I thought it should have been either. 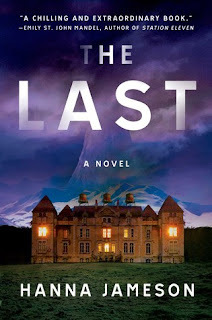 All that's to say The Last is an entertaining and dark read but not a particularly intellectually deep one. Which is completely fine with me as I'm not sure I could have handled too much deep though with something that hits so close to home politically. 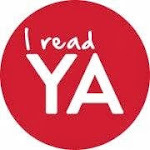 Good morning, readers. 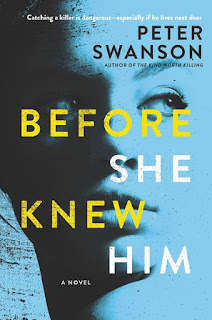 Today I'm a stop on the TLC blog tour for Peter Swanson's latest, Before She Knew Him. Hen has a history of getting a little... obsessed. Which is why, when she becomes convinced her neighbor might be a killer, her husband and the officials are just a little less than keen to take her totally seriously. But then one night Hen follows her neighbor and witnesses something horrible. Good news is that now she thinks she has what she needs to get the police to listen. Bad news is that the neighbor sees her! Hen has issues. She freely admits it. They're new to the neighborhood and it seems their neighbors, Matthew and Mira, might just be new friends in the making. But then Hen sees a trophy in Matthew's office that she's certain is connected to a murder that hit a little too close to home in recent years. Literally. The victim was from the area Hen lived in and she became obsessed with the case. Which is why no one believes her - she has a history of fixation and obsession that even resulted in her leaving school. The narration alternates between Hen and Matthew so we do find out rather quickly whether or not Hen is onto something. And of course Matthew knows rather quickly that Hen is telling people he's a killer. Peter Swanson definitely knows how to write a page turner. Unfortunately I find that his characters and plots lack a depth that I really am looking for in order to truly sink into a story. They're engaging and fun but I find I'm not able to really invest myself in the characters or the plot. It's a bit like popcorn - satisfying but not exactly filling. For more on Peter Swanson and his work you can visit his website here. You can also follow him on Twitter and Instagram. Good morning, everyone! 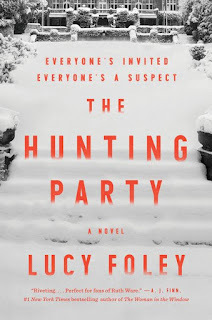 Today I'm a stop on the TLC blog tour for Lucy Foley's The Hunting Party. Every New Year, Katie and her friends get together the celebrate the holiday and spend time with one another. It's been their tradition since college. Four couples and Katie, and now an infant as well. It's the one time of the year that they all get together without fail. This year, their trip has been planned and booked at a remote lodge in the Scottish Highlands. They were told they'd be the only party there, but a mix up means there's another couple. It definitely doesn't make them happy, but the festivities will go on nonetheless. Until one of the guests at the lodge goes missing. By the time the holiday has passed, a body has been found. And it definitely isn't an accident. But who is responsible? Is it one of the close knit group? Is it one of the strangers? Is it one of the two lodge staff members? Or is it the Highland Ripper everyone has been talking about? I loved Lucy Foley's The Hunting Party! The setting alone makes it immensely appealing: a remote location and a snowstorm that's cut that location off from the outside world. Yes! Multiple narrators means multiple perspectives as the story progresses. And the timeline bounces back and forth as well, revealing the body and the fact that it's definitely murder before the reader has a chance to really get to know the characters at play. Doug, the gamekeeper with a dark past, and Heather, the manager with a secret in her own background, have both chosen to live and work at the lodge, voluntarily hiding away from everything and everyone beyond the grounds of the estate. Their perspectives of the group, jaded though they may be, are those of an outsider. Someone not part of the insular group, who doesn't share the history or the inside jokes or the forgiveness that a shared past can give to a person's behavior. But Katie, Emma, and Miranda each give a different perspective of the group and of themselves. And as the story goes on, two things become very clear: first, this group is absolutely not as close as it once was and second, that most, if not all of them, are hiding things from one another. But again, who is the killer? And, the thing that's most fun from the start, who is the victim?! The Hunting Party is fabulous from start to finish and makes for the absolute perfect snow day read! For more on Lucy Foley and her work you can like her on Facebook and follow her on Twitter. As much as I read, I never had much reason to delve into kids books before we found out we were expecting. But as soon as that happened, I started exploring picture books at an almost frenzied pace! I had a list of them on our registry, I was given a stack of them at my book themed shower, he's been getting them as gifts, and I've been buying a maybe unhealthy amount of them too. But as an enthusiastic reader myself (my husband reads his fair share, too) of course I want my son to love reading. And I love reading to him! Kimber was only out of town for a few days but when she gets home she finds her locks changed and a stranger living in her house. When the police arrive, the stranger presents a rent agreement claiming that Kimber invited him to stay. But Kimber never rented out her house. Kimber doesn't know the man. And now she can't get him to leave. 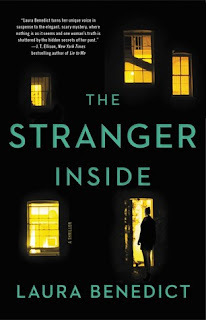 As Kimber tries desperately to get her house - and her life - back, the stranger counters every attempt. The police aren't on her side and there seems to be little she can do. Anger and frustration, not to mention confusion, have become Kimber's everyday life. And now paranoia had joined the club as she becomes certain the stranger is out to take more than just her home. I love Laura Benedict's work. Just flat out love it! This latest is a bit of a change as it's straightforward thriller with no horror or supernatural aspects, but, if you couldn't tell, it still has a healthy dose of dread and high emotional stakes. I can't imagine what I would do if I left for a weekend to myself and came back to find my house occupied by someone else. And to find out the police aren't interested in helping! That's the situation Kimber is in when the stranger claims he has a right to be there. And as time goes by, he even gets the police to believe that Kimber is stalking him! So Kimber's life is not only upside down, she's being treated like a criminal. But as it turns out, Kimber isn't exactly a great person. She's done some things in the past that reflect a little... poorly on her character. And so she needs to tread carefully where the stranger is concerned. Which makes this a twisty, turny read from the get go. For Kimber and the reader both. Paranoia is the key here and it comes through on every page of The Stranger Inside. And the questions that drive the plot - Who is the stranger? Why is he out to get Kimber? And what are these shady secrets Kimber is so determined to keep to herself? 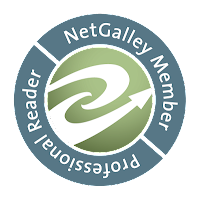 - are guaranteed to keep readers frantically turning pages until the big reveal at the very end. If there’s one thing I love as much as books, it’s food. And so it’s natural that I’d have a bit of an obsession with cookbooks, right? Glossy pictures of mouthwatering food are just part of it. In order for a cookbook to appeal to me, the recipes have to be enticing and approachable. I’m not a Top Chef, after all. I’m simply a girl with a little more than a working knowledge of my way around a kitchen. By which I mean I have no professional training but I’m beyond “cooking for dummies” level. I’m also not a food snob. Recipes in any book I add to my collection have to be somewhat budget friendly. Honestly, though, in terms of recipes that are going to appeal to me, they are generally going to be somewhat budget friendly in that I don’t exactly gravitate to caviar and foie gras or wagyu beef (a good filet is fine for me). Chrissy Teigen’s Cravings: Hungry for More definitely fit these first two requirements. The recipes included run the gamut of junk food (her Mushroom & Crispy Shallot Nachos are amazing!) to fancy dinners (Steak Diane with Crispy Onions, the most complicated dish I’ve made so far and only because frying the onions was a bit time consuming), Asian classics (Beef Randang) and American twists on Asian classics (Lazy Shrimp & Pork “Wonton” Soup) and hearty comfort food (Crispy Bacon & Sweet Pickle Patty Melts are not to be missed). The recipes are about as un-pretentious as you can get - and Teigen comes across the same. In addition to being a collection of dishes any home cook can make in their kitchen, it’s also a glimpse inside Teigen’s world as well. And dare I say it’s a world you might not expect if you only know of her as a supermodel! Let’s just say she’s not afraid to eat or speak her mind, which I find abundantly appealing. And amusing. Because if you can have fun with your food, all the better! I’ve done quite a bit of cooking out of this book since getting my hands on a copy last fall. And I’m late in reviewing only because I have a new baby to keep me occupied. And yet, I’ve still been able to cook. Lots of our friends have been amazed by this but nothing I’ve made since bringing the baby home has been overly complicated. And plenty of it has come from Cravings! King’s Hawaiian Pull-Apart Bacon Grilled Cheese sandwiches were part of our Christmas Eve festivities. Bacony Clam Chowder made for a surprisingly easy and fabulously cozy dinner one snowy evening. Avocado with Toasty Crumbs made for an easy breakfast and a great alternative to avocado toast. Oh, and the Parmesan Minestrone with Chili Mayo Toasts was simple and fabulous, just one of the make ahead freezer meals that I made before the baby arrived for hectic nights after he was here. I've made many more dishes from the book so far and none of them has been anything less than excellent. Anyone who loves tasty and uncomplicated food should definitely add this book to their collection. It's a go to in my kitchen now for sure! Happy Friday! 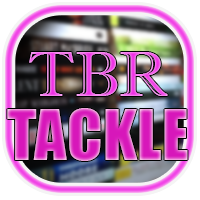 Today I'm a stop on the TLC blog tour for C.J. Tudor's latest, The Hiding Place. Arnhill isn't a town Joe would choose to return to without reason. A mining town whose mine has been closed for decades, it's a miserable place to live. But Joe has come home and he does have a reason to be there after all. A very personal reason. One that traces back to his childhood and the fate of his beloved sister. Arnhill hasn't aged well in the time that he's been away. And it seems the very things that caused him to leave in the first place might be happening again. Joe takes a job as a teacher at the very school he once attended. Immediately he recognizes the son of one of his old gang as the local bully, stepping in on his first day as the boy relentlessly picks on another student. And earning himself an enemy for his efforts. But that's just the beginning and the least of Joe's worries. 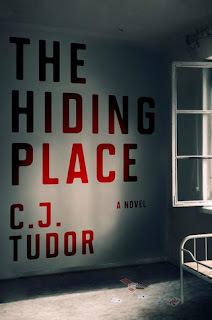 C. J. Tudor's latest is dark, dark, dark. Just the opening pages alone are enough to warn away a reader without a strong stomach! Diving into The Hiding Place was like jumping down a rabbit hole of creepy. And considering I started at bedtime... well, it did not make for a restful night! We don't know from the start exactly what Joe's motives or history are. He alludes to his sister's disappearance, he also alludes to her return, and he outright lies to those around him about what happened to her (which means the reader is in the dark for a good bit as well). We do know he's prompted to return to Arnhill after receiving and email that cryptically says it's happening again. And he chooses to move into a house where a teacher killed herself and her son under incredibly disturbing circumstances. We also know Joe is on the run and in debt. And that's it. That's what we start off with. It was enough to hook me, that's for sure! That and, as I mentioned, the incredibly dark and creepy nature of the story. Because even with very little information, Tudor deftly builds an almost overwhelming sense of dread and suspense. I had to know what was going on! What happened to Joe as a teenager? Why is he back in Arnhill? And what does the teacher's death have to do with it all? Agh! The payoff, the big reveal, and the twists along the way were all worth it! Tudor straddles a fine line between horror and thriller and is a perfect read for fans of both genres. Given, of course, that you can handle the opening pages! To see more stops on the tour be sure to check out the official TLC tour site here. For more on C.J. Tudor, you can like her on Facebook and follow her on Twitter.